Each year over Memorial Day weekend, the Active and Alumni brothers converge on Bass Lake for our annual weekend of fun. This tradition has taken place for 60 years, and has evolved from an impromptu weekend getaway into the largest annual gathering of brothers. 'BASS' is a weekend full of traditions that only get better year after year. and the bonds of brotherhood span generations. 1962: The first 'Bass Lake' was over the Memorial Day weekend in 1962 in Yosemite on the Merced River. 1966: This year we were told to 'leave' Yosemite and as the brothers headed down the mountain took a left at Bass Lake exit (Road 222) where they finished their weekend. 1978: The first weekend where the brothers were not at Bass Lake or Yosemite, but rather went to Lake Oroville. 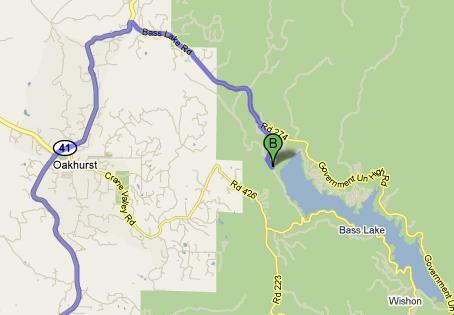 The brotherhood made a collective decision to utilize a house and ski boat Greg Shephard (47th) had on Lake Oroville. 1987-1999: Bass Lake was held at Crane Valley Campsite (starting at campsite D and eventually growing to include the entire campsite as more and more brothers and alumni joined the house and returned for the weekend). 2000-2001: The first Bass Lake weekend held at the Recreation Point Campground. Also this is the first Bass Lake where over 100 brothers (active and alumni) attended. Brother Mike Owens, acting as Alumni Corporation President at the time, made the decision to change campgrounds. 2002: Bass Lake moved back to Crane Valley campsite due to 'scheduling issues'. 2003: Bass Lake returned to the Recreation Point campsite. 2005: Bass Lake moved back to the Recreation Point Campground. 2006: The first annual Brotherhood Horseshoe Tournament was played. Won by Ryan Celaya (90) and Sean Graham (90) by the fire pits. Subsequent Horseshoe Tourney's have been played mostly at the beach, depending on the water level. 2011: During the 'Sunday Sitdown' it hailed and we had a snow/ice ball fight. While at the horseshoe tourney on the beach, it became very evident how 'Sleeping Beauty' got his nickname. Technically this was the 50th Memorial Day weekend event in AU/DU history. 2012: 50th anniversary held of the first Memorial Day weekend event in Yosemite. Horseshoe team of MacKenzie and MacKenzie dominate the competition. 2016: For the first time ever 'Bass Lake' was not held at either Bass Lake or Yosemite. Due to the 5+ year drought in California, the trees around Bass Lake and at Recreation Point had become infested with bark beatles, weakening the roots and making it the campsite uninhabitable while the trees in the area had to be removed. AY/DU was able to successfully located a new site for the brotherhood at Steckel Park, near Ventura. The motto for this year was "You can't chop down tradition!". This was also referred to as 'So Cal Bass'. (125 brothers attended). #FuckYouChaffee also originated. 2017: After a one year hiatus, the brotherhood returned to Recreation Point, at Bass Lake. The water level at the lake was the highest its been in 7+ years. 154 brothers registered for Bass Lake via the auducalpoly.com website, a new high. * Exit Recreation Point campsites and turn right onto South Shore Road (Road 222). * drive ~0.4 miles, the shooting spot is on the right side of the road. Drive up the small incline and you will be at the shooting spot. Chukchanisi Gold Resort and Casino (866.794.6946) - Bill Cockshott (5th) stays here.